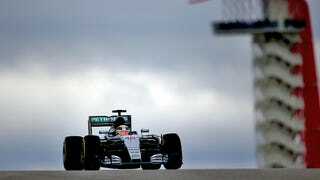 It’s not the state of Texas who’s coming to save the United States Grand Prix. It’s the teen girl squad. Knowing that last year’s Formula One race was a rain-soaked, money-losing catastrophe, Circuit of the Americas announced today they’re bringing out the big guns: a huge Taylor Swift concert. The news that the race was on for 2016 was leaked last night, but now it’s official. After months of speculation where the race was listed as subject to confirmation on the Formula One schedule, the U.S. Grand Prix will go on as planned at Circuit of the Americas this year on October 21-23, 2016. According to COTA chairman Bobby Epstein in a press conference this morning in Austin, the fee to secure the U.S. Grand Prix’s date on the 2016 calendar has been paid, and that the latest version of the calendar he saw included no “subject to agreement” asterisk next to COTA’s event. Whew. Epstein explained that the circuit was able to address their financial challenges without the full expected $25 million contribution from Texas’ Major Events Trust Fund. He said the $19.5 million they did receive from the state combined with the settlement of a lawsuit that will save COTA an estimated $13 million in taxes both played a significant role in saving this year’s race. Epstein previously told Forbes that the track was doing what it had to do to ensure that the race would go on this year, and we’ve noticed some shuffling around in staff accordingly. Curiously, Epstein seems certain that COTA can raise the event’s Major Events Trust Fund contribution back to the original $25 million they originally planned on receiving. With the state’s new method of calculating events’ revenue, COTA will be forced to attract more out-of-state revenue in order to receive $25 million from the METF again. The track budgeted for that $25 million, and they want it back. As with last year, it’s an uphill battle with many F1 fans in the region split between going to the U.S. Grand Prix and going to the Mexican Grand Prix only a week later. Fortunately, it looks like they’ve taken many fans’ suggestions to heart. Epstein announced that COTA will be lowering prices, insuring themselves against a rain-out, moving more things away from potential mud pits if it does rain, and most importantly, adding a race-weekend concert that isn’t aimed at olds. The biggest news of the day wasn’t the pleas for fans who were burned by last year’s miserable weekend to return. It was the addition of T-Swift to the schedule as a huge Saturday night infield concert. This year, we plan to host the biggest concert in Austin history. By combining the greatest annual global sports event with the number one performing artist in the world, Taylor Swift, we are creating the ultimate destination event. “The biggest concert in Austin history”? That’s sure to ruffle some feathers, Bobby. Previously, the track has scheduled post-race acts like Kid Rock and Elton John that seemed to be aimed at F1's existing older fanbase. Swift’s audience is younger and may not necessarily know or care enough about Formula One to buy a ticket just to watch awesome race cars. A lack of other opportunities for Swift fans to see her perform in person should also drive up ticket sales. So far, COTA’s F1 date is the only Taylor Swift concert currently scheduled in the United States. You’d have to be blinded by overplayed-Ryan Adams-cover-induced rage not to admit that this is a huge grab for the track. They’re finally looking for ways to grow the appeal of F1 weekend, and that’s only going to happen if they think beyond their current fans. Simply put, Taylor Swift’s rabid following is exactly the kind of nationwide fanbase COTA needs to generate the kind of out-of-state fan revenue they need to survive. If you’re worried about Taylor Swift fans (and/or yourself) being priced out of the weekend, one other promising note came out of today’s announcement: prices will be lowered. Epstein explained that ticket prices will be reduced by an average of 10 percent this year, parking will be about 30 percent lower, and food and beverage costs at the track itself will be reduced as well. For fans primarily interested in a certain Saturday night concert, an expensive grandstand or suite pass isn’t really necessary. General admission should do the trick, as the Swift concert itself isn’t tied to a certain “level” of access. If, for reasons I will never understand, your usual race attire involves heinously impractical heels for no good reason, good news! COTA is also going out of its way to make sure you won’t sink into the mud. So much of Epstein’s announcement today was spent apologizing for last year, when the facility devolved from its usual park-like setting into a giant mud pit. It’s obvious that the track is still reeling from the weather-affected 2015 grand prix, and thirsty to get disappointed fans back in the gates for this year. The circuit can’t just rely on Swifties to get the kind of attendance they need to regain their $25 million METF contribution. If they want to buck their trend of declining weekend attendance, they’re going to need to woo F1 fans back and add to their numbers, not merely replace them. Fortunately, the improvements needed to convince last year’s F1 fans to return will make the venue better for everyone. Other changes are simpler and won’t cost COTA much to implement, such as moving restrooms and other track services such as bus waiting zones and shuttle lots onto paved ground. Additionally, the highly efficient and expansive shuttle program from off-site lots to the track as implemented for COTA’s first grand prix will return in full force. Cheaping out on shuttles and transportation plans has only exacerbated traffic issues around the facility and fans’ mud-caked woes in the past few years. This year, if you don’t want to park in an unpaved lot by the track, you’ll have more options. Most importantly, if all else fails and it rains two or more inches in the 24 hours preceding a race day, they’ve promised to refund 105% of the ticket cost. The event may still go on despite the refund, but no one will feel as if they’ve overpaid to watch a will-they-or-won’t-they qualifying session again. Epstein explained that these refunds are something the track has insured itself against, so as not to be a significant surprise cost if there is crappy weather for F1 weekend again. “The content has to be the incentive,” Epstein told the press. F1 is in a weird state right now, with some promising results out of pre-season tests but also several changes fans are unhappy with. COTA’s big plan to revive the U.S. Grand Prix seems promising, but almost feels like an admission that F1 can’t sell itself like it has in the past. Epstein mentioned that the Swift concert provides a reason for families to come, and that the broader appeal will hopefully grow the event by exposing it to new fans. While that almost feels like an admission that motorsports are uncool, it’s also a solid, forward-thinking plan. F1 will die with its fans if it constantly panders to its own audience.